Summer is here. Well, not official summer, not astronomical summer, but a northwest summer. I like how summer starts all of the sudden in pacific northwest. One day it is cold, rainy and gloomy and the next day it’s sunny and warm. And it does not get back to the way it was all winter. The trails get crowded with happy faces. Finding isolation becomes harder. No complaining here. Today is such a day. I woke up and realized that. Birds are singing to the rising sun. Trees have put their green summer clothes. They are not quite the dark green of mid summer but a fresh bright green shimmering in the morning breeze. As it became my recent habit I went to another hike I have not been to. Just to walk the woods. The parking lot at the trail head was packed. Well, that’s summer. I found a spot, got my backpack ready and hit the trail. This time I had spent some time researching trails around. I was looking for trails that would cross creeks. It is a good time to walk those trails. Snowcaps are melting filling creeks with water. Many of them will dry up by the middle of summer. The trail was going to Mason Lake and Bandera Mountain. The trail indeed crossed several creeks. One of them was really full of water and had an impressive waterfall. I’ve composed the frame and it was turning out to be even better than I thought. Except one thing: there was a bright light spot from the sun breaking thru the trees in one corner of the frame. It just did not work. I decided to try it again on the way down. On the way down I stopped by the waterfall again and the light completely changed. The waterfall was in full light. Which did not work either. Oh, well, maybe some other day. One week later. It looks like winter has come back. It is cold, overcast, and gloomy. It might be a good time to visit the same waterfall I visited a week earlier. Overcast might be just the right weather for it. 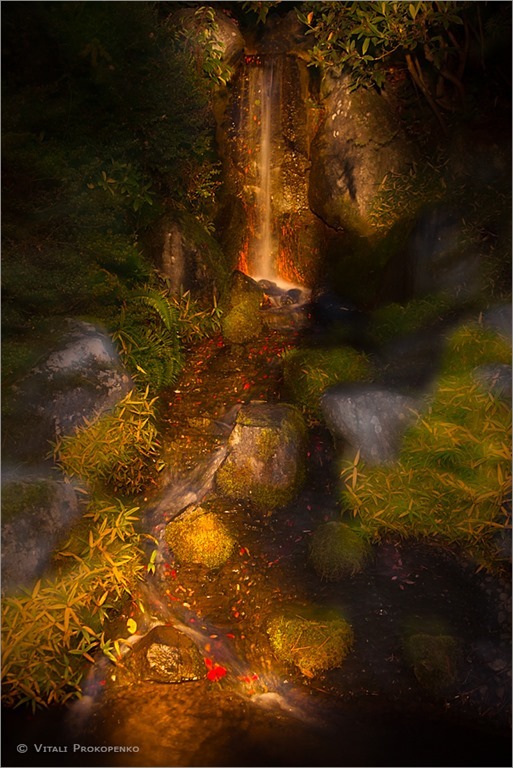 The scene might be more evenly lit with less contrast between light water and dark rocks. Here it is. The overcast might have worked better then sunny. I still wonder how it looks like in twilight. Maybe some other day. And here is a little bonus. A small creek I crossed on the way to the waterfall. Do I really need to travel far to make photos? Just last weekend I’ve discovered a hike which is only half an hour of driving from my house and yet it has some beautiful waterfalls, creeks and alpine lakes. Well, I have not got to the lakes yet. The two times I went to that hike I got caught up too much with the waterfalls. There are four(!) waterfalls in just the first two miles of the hike. I still see several image to be made even with closer waterfalls and with the furthest I’ve got to so far I’ve just scratched the surface so to speak. Now I plan to make it all the way just to see everything that it has to offer. I’m still in awe if the beauty of the place I live in.